In early February 2012, we hooked up our travel trailer and headed north on U.S. Highway 101. Our destination was the Wine Country RV Resort in Paso Robles, California. Arriving before dark, we finished our setup and then sat down to dinner. Accompanying our roasted turkey breast and trimmings was a bottle of Castoro Cellars Paso Robles 2010 Cabernet Sauvignon. With a foggy chill setting in outdoors, the red wine and white meat became perfect gastronomic partners. A day before, I had visited our local Costco. My mission was to buy provisions for our Paso Robles wine country adventure. Although I had never purchased a bottle of Castoro Cellars wine before, the simplicity and elegance of their label attracted me. At less than ten dollars per bottle for an estate-grown, produced and bottled “Paso Cabernet”, the Costco price was exceptional. As it turned out, my instincts were correct. Unlike many Central California Cabernet Sauvignon of yesteryear, from the first sip to the last, this 2010 Cab was a multifaceted jewel. The following morning, we awoke to cloudy, cool weather. Undaunted, we planned to go out for wine tasting that day. By noon, the weather had warmed to almost sixty degrees and the sun shined lightly through a winter haze. Heading west on California Highway 46, also known as “Windy Way”, we soon saw a billboard featuring Castoro Cellars and their motto, “Dam Fine Wine”. In Italian, castoro means beaver. In this case, the “dam” refers to that industrious animal as well. After a brief jaunt south on U.S. Highway 101, we regained California 46 West, known there as “Green Valley Road”. In the coastal live-oak parkland of the Paso Robles Wine Country, we found a profusion of small and medium sized estate wineries. As we turned on to North Bethel Road, Peachy Canyon Winery, with its oak-studded vineyard greeted us. A bit farther along the road, we turned right at a driveway leading through an old head-pruned Zinfandel vineyard. 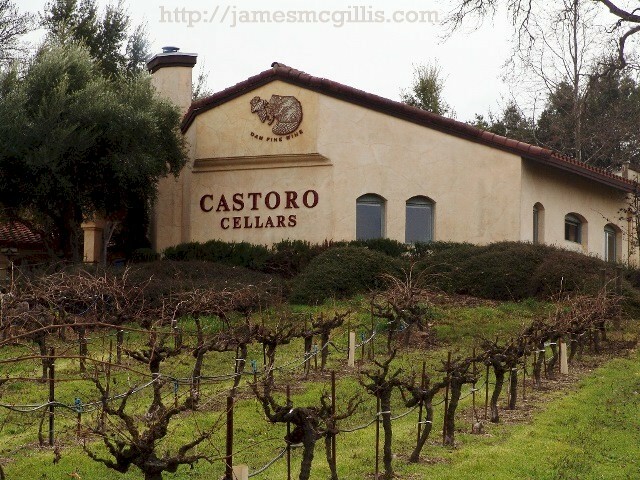 Nestled there in Cobble Creek Vineyard is the Castoro Cellars Tasting Room. After parking our car, I stopped to take pictures of the vineyard in its winter dress. With its leafless grape arbor, the path led gently uphill to the tasting room. 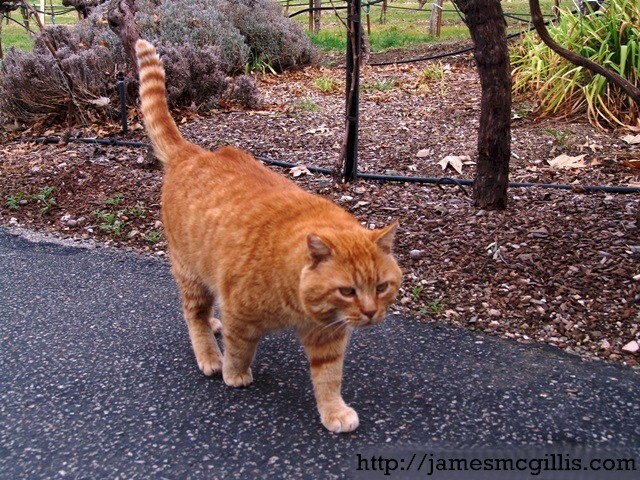 At the foot of the path, a big red cat greeted Carrie and me. Immediately, I realized that this was no ordinary red cat. For that moment, at least he had adopted us and was leading us up the hill. Upon arrival at the courtyard above, the cat waited for us to open the door and then disappeared inside. While standing just inside the doorway, we surveyed the busy tasting room. Attracted to a flickering fire in the large stone fireplace, I spotted a love-seat that faced the glowing hearth. 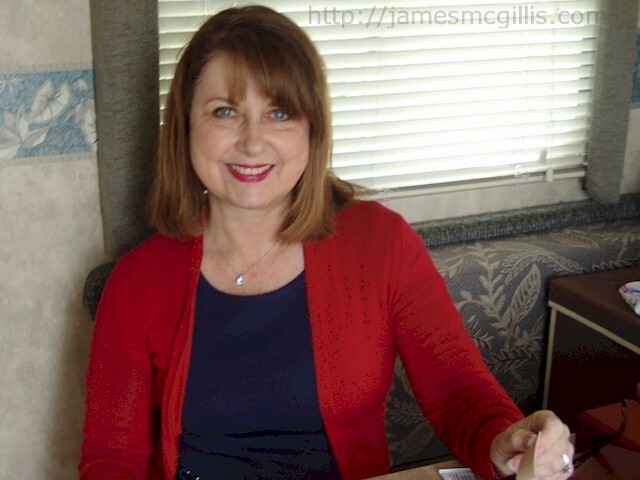 Thinking that it might be nice to rest and enjoy the fire, I moved toward the love-seat. 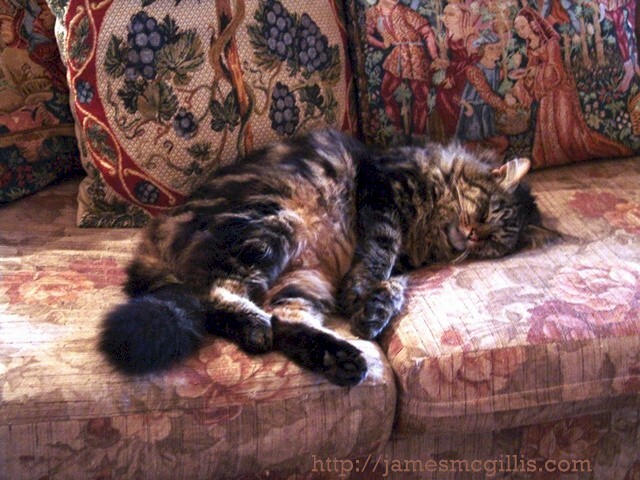 Just before I sat down, I realized that a cat, camouflaged with the colors of the love-seat was sleeping there. Later, we discovered that both were “outdoor cats”, meaning that they stayed outside all night, even in cold, wintry weather. Since the love-seat was off-limits, we entered the second of two tasting rooms within the building. Inserted neck-down in one of the large racks, I found a rare 1996 Paso Robles Zinfandel. Pioneers such as Ridge Vineyards and David Bruce Winery had made Zinfandel wines from Paso Robles vineyards as early as 1967. Because of their excellent reputations, current offerings from both David Bruce and Ridge include only recent vintages. Some will claim that Zinfandel does not have the longevity of Cabernet, but I disagree. If well vinified and cellared, an old Zinfandel can be every bit as good as an aged Cabernet. If the just released 2011 “Zinfusion” we tasted at the bar that afternoon is any indication, my old 1996 Zin should be quite an interesting wine. 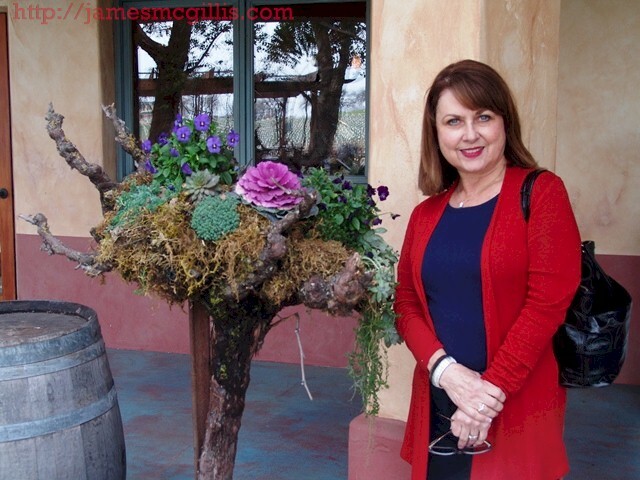 In the courtyard, we found old head-pruned Zinfandel vines re-purposed as fanciful planters. Even with annual pruning and great care, some old vines must go and new vines must take their place. 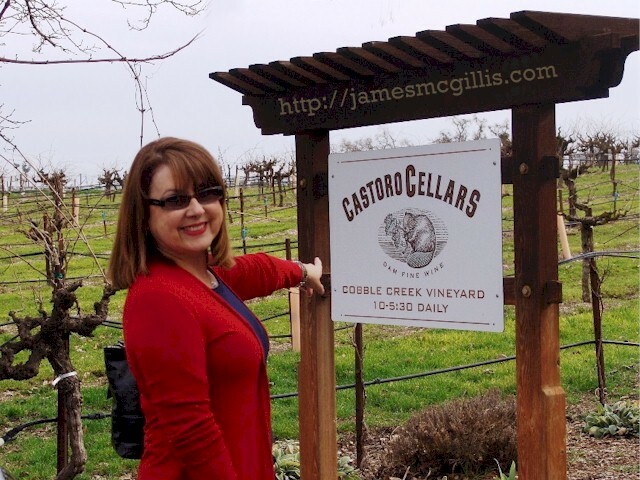 With an extensive array of solar panels on the roof of the tasting room and a commitment to sustainability, the “recycle, reuse and re-purpose” ethic at Castoro Cellars is strong. After seeing the beauty of dead grapevines sprouting a cornucopia of flowers, moss and succulents, we purchased two bare vines. After “planting” the dead grapevines on our patio, I will write an article about planting our forty-year-old rustic sculptures. According to a recent count, there are more than one hundred eighty bonded wineries in the Paso Robles Wine Country AVA. Any place named for a beaver and run by cats is my kind of place. With its beautiful setting, organic architecture and great wines, Castoro Cellars is now my favorite winery in Central California. 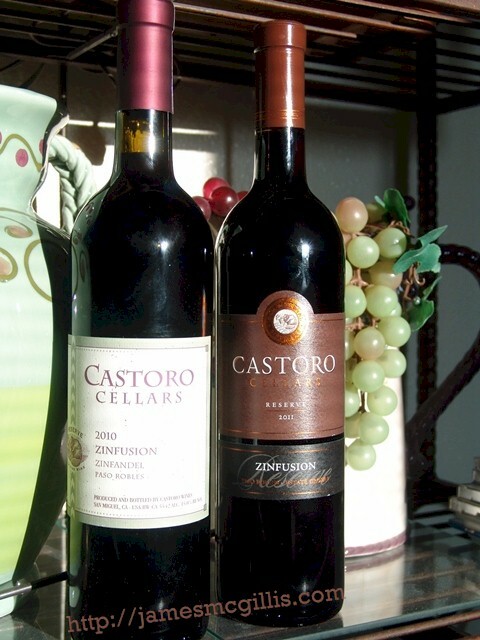 If you visit “Paso Wine Country” and partake of a Castoro Cellars’ classic Zinfandel, be sure to tell them that Moab Jim sent you.